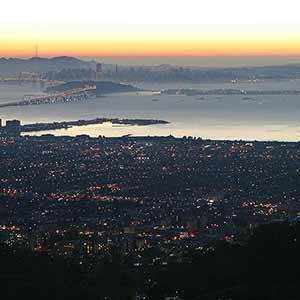 The Skyline-to-the-Sea Trail is one of the most popular backpacking routes in the Bay Area. The hike is usually done in three days, each with better scenery than the last. 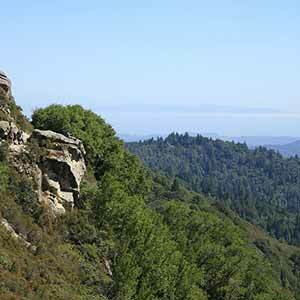 The first day’s hike starts in Castle Rock State Park at Saratoga Gap and descends alongside busy Highway 9 to Waterman Gap. 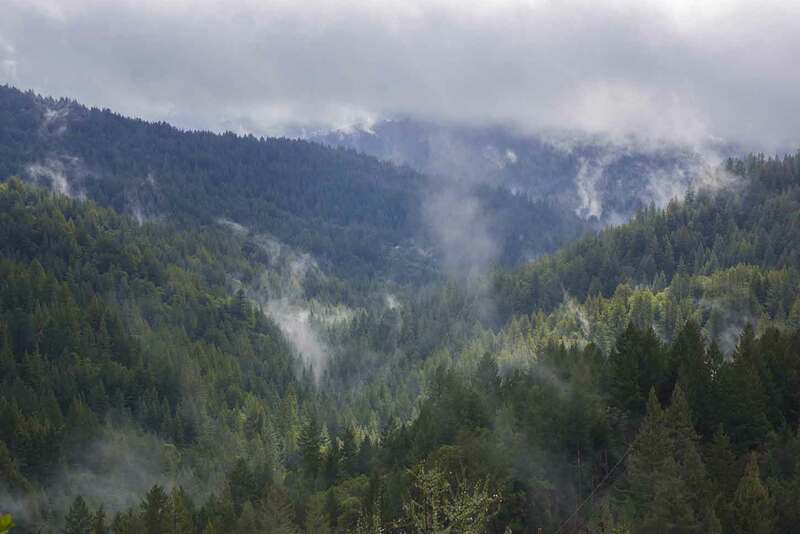 On the second day, the trail leaves Highway 9 behind and enters Big Basin Redwoods State Park, descending into an outstanding old-growth redwood grove and ending at Jay Camp, near the park headquarters. The final day of hiking is by far the best, descending through wilderness old growth, passing by Berry Creek Falls, and ending at Waddell Beach. The trail is usually said to be about 30 miles long, but my GPS puts it at 25 miles. 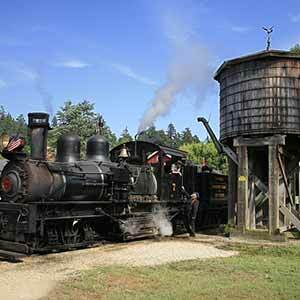 However, side trips to Berry Creek Falls, the redwood loop, and Jay Camp will add a few more miles. Reservations are required to use the campgrounds; visit the backcountry trail camp website to make reservations up to two months in advance or call 831-338-8861 for same-day reservations. The total fee for two nights and up to 6 people is $38.00, including parking for one car in the main Castle Rock lot. Some area trail camps may be closed between November 1st and April 30th. The Skyline-to-the-Sea Trail can be impassable after winter rains (especially at the stream crossing just after Berry Creek Falls; unfortunately there’s no easy detour if the bridge is out) and closed due to summer forest fires. Trail closures aren’t posted online or at the trailheads, so the only way to find out about trail conditions is to call or visit the park office (831-338-8860). This is a one-way hike and there’s currently no public transportation to the area, so the best way to get back to the starting point is to get someone to drive you; if there’s no traffic it’s about a one-hour drive from Waddell Beach to Castle Rock. A popular option is to park a car at each end of the trail. 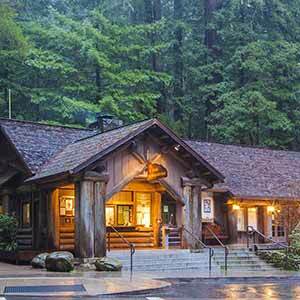 In this case you won’t be able to start from Saratoga Gap, since there’s no overnight parking in the area. Instead, you’ll need to take the Castle Rock route described below and park in the main Castle Rock parking lot. To park at Waddell Beach you’ll need to reserve a thru-hiking permit by calling park headquarters at 831-338-8861 in advance of the hike. The permit lets you park next to the ranger station, which is a half-mile up the Skyline-to-the-Sea Trail from the beach. If you want to call someone for a ride, be aware that there’s no cell phone coverage anywhere in Big Basin, but there is a working pay phone at the end of the trail. The phone is on the side of the restroom building by the Rancho del Oso ranger station. Two possible routes for the first day are described below. 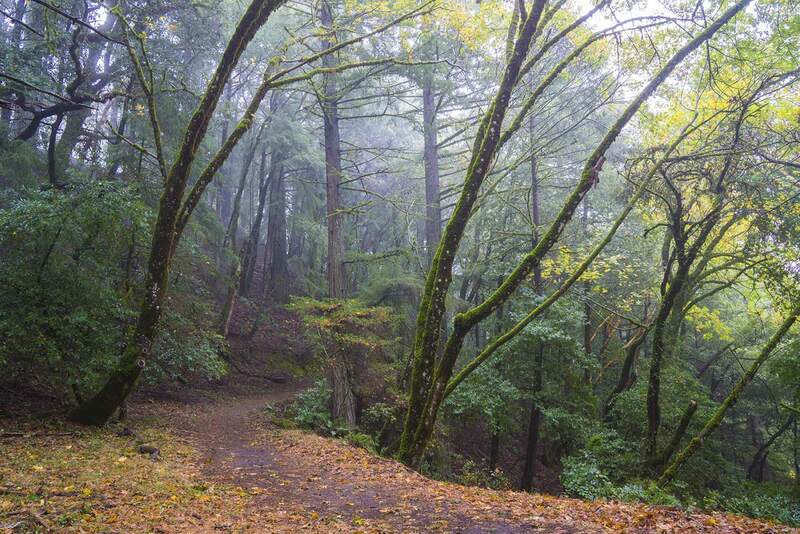 The Saratoga Gap route, which follows the actual Skyline-to-the-Sea Trail, is easier and has more attractive woods. 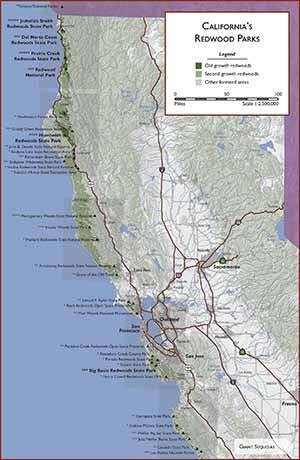 However, there’s no overnight parking anywhere near Saratoga Gap. So if you need to park a car overnight at the trailhead, you’ll have to start three miles up the road and take the Castle Rock route. This is the officially recommended route, and it’s the way that most Skyline-to-the-Sea hikers go. The Castle Rock route is longer, and the trail is rougher, but it does have some great views that add variety to the hike. The Skyline-to-the-Sea Trail begins across the street from the Saratoga Gap Vista Point parking lot; walk down Big Basin Way and past the big roadsign to find the trailhead. The wide, well-maintained, and well-marked trail descends gently. The trail crosses to the right side of Big Basin Way and continues to descend, running about 20 or 30 yards downhill of the road, just far enough that you can’t see it. On this side of the road you can’t generally hear the gunfire from the nearby Los Gatos Rod and Gun Club. If you don’t mind the traffic noise, it’s quite a nice section of trail. The woods are especially attractive for the next half-mile or so, lush and open with moss-encrusted trees and some large silver-barked firs. 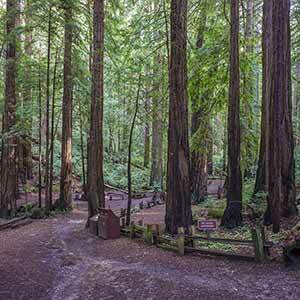 Later, just before the trail reaches a big roadside vista point, the first redwoods appear: some large redwood stumps are visible in a ravine below the trail, and six small redwoods (possibly old growth) grow next to the trail. It’s unusual for redwoods to grow at this elevation. At the paved road to Camp Chesebrough, a dead-end dirt road to your right descends into this unexpected grove. The trail joins the paved road to Camp Chesebrough and crosses Big Basin Way again at the vista point, which is known as Sempervirens Point although the name doesn’t appear on any road or trail signs. For a nice view, take a quick detour to the vista point’s busy parking lot and look for a well-established unofficial trail that leads down the grassy hillside. 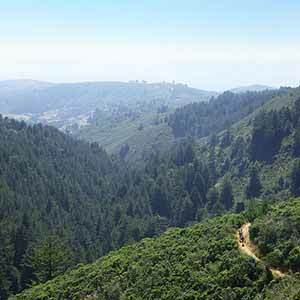 After just a few yards, the trail reaches an excellent viewpoint with sweeping views of the green-carpeted Santa Cruz Mountains. There seems to be more traffic noise after this point, but at least it covers up the sound of gunfire from the nearby shooting range. The woods become somewhat mundane for a few miles after the vista point, but after Beekhuis Road the redwoods start to become more common. 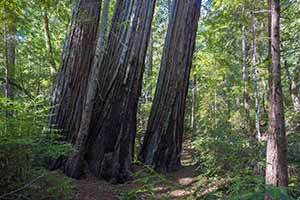 At first there are a few small but attractive clumps of little redwoods, with stretches of tanoak and other hardwoods in between, but the redwoods become larger and more common as the trail descends. Around Waterman Gap, redwoods are the predominant species and it’s the other trees that are confined to small patches. The sound of gunfire ends at the first dirt road crossing after Beekhuis Road. There are a few more short stretches where it can be heard, but it’s not intrusive after this point. At one point a pretty new-looking wrecked Ford Explorer can be seen just below the trail; the car crashed in 2015. Its doors have been spray painted with Xs to indicate that it’s empty. Only a few hundred yards later is a second wrecked car that looks like it’s from the 1970s. Waterman Gap Trail Camp is a large open area under the trees. There are six campsites. The sound of traffic from nearby Highway 9 can be heard, but there’s no sound of gunfire. The camp has a toilet and water, although the water supply may not be dependable. Park in the Castle Rock parking lot; overnight parking is not allowed on the Skyline Boulevard. If you paid the camping fee, there’s no additional fee to park. 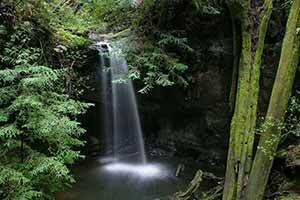 Take the Saratoga Gap Trail, which descends through a lushly wooded ravine to a waterfall. You can’t get a really good view of the falls since the viewing platform looks almost straight down at the waterfall. Not long after the waterfall, the trail emerges from the forest onto a high escarpment with some pretty nice views over the Santa Cruz Mountains. This section of trail is rough and rocky, with a small amount of easy scrambling over boulders, and can be annoyingly slow. Fortunately it’s the only such section on the entire 3-day hike; the Skyline-to-the-Sea Trail is otherwise remarkably easy to walk. The views are possible because, unusually for this normally lush area, much of the escarpment is covered with chaparral. However, there are also wooded patches. Look closely and you may see the tiny Patrick Charles Allen grove of redwoods, the first redwoods of the hike. 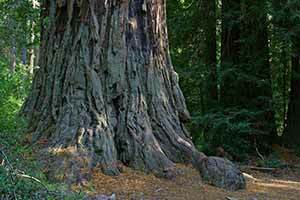 The redwoods are really small and it’s easy to miss them. The escarpment culminates with a set of narrow steps precariously cut into the side of a sheer cliff. A cable strung along the rock face gives you something to cling onto. This is the scariest part of the entire hike; fortunately it’s brief. The trail makes a sharp turn to the right, leaving the escarpment and the chaparral behind and re-entering the typical tanoak forest of the area. At the Castle Rock Trail Camp there’s a confusing 5-way intersection; take the Saratoga Gap Trail, which becomes a dirt road. During the day on Fridays and weekends, the trail camp gets a lot of gunfire noise from the nearby shooting range. The Travertine Springs Trail runs through chaparral for a while before descending into the remarkably lush San Lorenzo River valley. After crossing the river, the trail, annoyingly, climbs out of the valley. At this point the sound of gunfire, which had faded away, returns for the next few miles. Turn left onto the Saratoga Road Trail, continue downhill for a mile, then climb the Beekhuis Road Trail to the Skyline-to-the-Sea Trail. There’s a lot less traffic noise after Waterman Gap. The trail still runs alongside Big Basin Road, but there aren’t as many cars here and they can’t drive very fast on the narrow twisty road. Just after Waterman Gap, the trail enters a small old-growth redwood grove. Although there are some redwoods before this point that may be old growth, this is the first grove that is undoubtedly old growth. The trees aren’t huge, but they’re noticeably bigger than anything so far. They also have smoother bark. There’s a initial cluster of redwoods, then the trail leaves the main grove, but there’s still an occasional old-growth redwood by the side of the trail for the next half-mile. The old growth comes to an end when the trail crosses from the left to the right side of the road, briefly entering a heavily logged area which is also much less lush-looking. The trail begins to climb through a dense tanoak forest. As it approaches China Grade, the woods become lusher and denser, passing patches of redwoods and one or two pretty good sized old-growth trees. 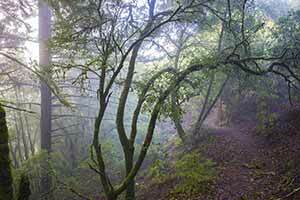 When the trail crests at China Grade and starts descending, there’s an abrupt change in scenery as the tanoak and redwood forest gives way to a mixture of tall scrub and groves of dwarf trees, with glimpses of the conifer-covered hills of Big Basin. This is one of the more open stretches of trail, and the sunshine and views really help to lift the spirits. 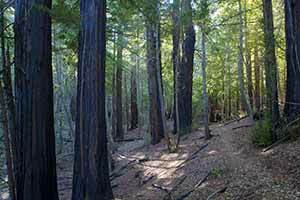 The trail enters denser forest, then makes a hairpin turn and descends into the deep shade of Big Basin’s main old-growth redwood grove. The descent into the redwood-filled canyon is one of the highlights of the hike. Although there have been redwoods and even some old growth since nearly the beginning of the trail, it’s immediately obvious that this grove is something entirely different. The colors are lighter and it’s much lusher, but most of all it has a much bigger scale; seen from midway up the canyon wall, its depth and expansiveness are truly impressive. The sheer amount of foliage, lofted high into the air by impossibly tall, slender trunks, is mind-boggling. The trail bottoms out at a fork of Opal Creek. This is the best part of the grove, with huge redwoods growing around the burbling stream and a lush groundcover of ferns and redwood sorrel. The trail meanders pleasantly through the woods, crossing a second fork of Opal Creek. The redwoods are smaller here but it’s still quite a sight. The trail continues alongside Opal Creek, still under old growth, for an exceptionally enjoyable mile before coming to a T intersection with a paved road that’s closed to cars. At this point you can either hike on the road all the way to Big Basin headquarters, or take a trail that runs right next to the road. I usually take the road because it’s easier and is just about as scenic as the trail. 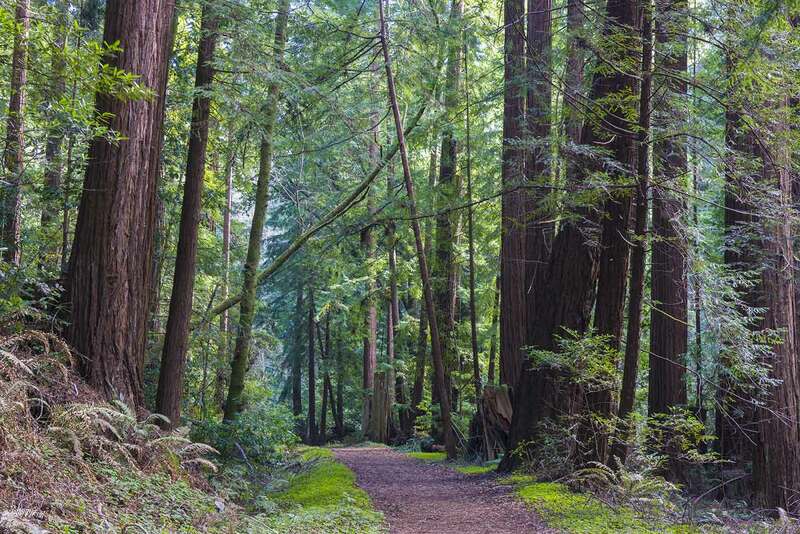 The area around the Maddock Cabin Site is kind of dull, being devoid of big redwoods, but then the biggest redwoods of the hike appear as you approach park headquarters. The busy Park Headquarters area has several big, bustling campgrounds, but there’s a small, relatively quiet campground just for backpackers. 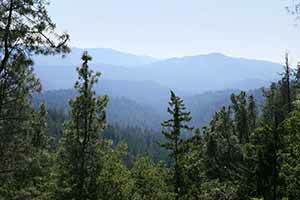 Jay Trail Camp is conveniently located just off the Sequoia Trail about a quarter-mile from the Skyline-to-the-Sea Trail. 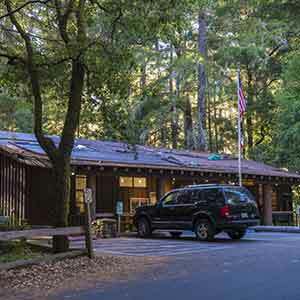 From the trail, follow the sign for park headquarters or Jay Trail Camp; the Sequoia Trail angles up the hill to the right of the headquarters building. Water and showers (bring 6 quarters for the showers) are available. The park’s store sells snacks, chili, and some camping supplies; however, it’s only open weekends in November and is completely closed in December and January. 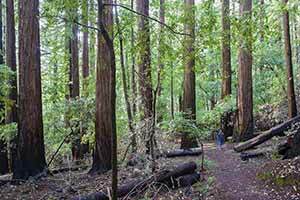 It’s worthwhile to walk the short Redwood Loop trail, where Big Basin’s biggest redwoods can be found. Continuing on, the Skyline-to-the-Sea Trail climbs up to Middle Ridge through dense, almost jungle-like woods. The dense appearance mostly comes from a heavy understory of tanoak and huckleberry. 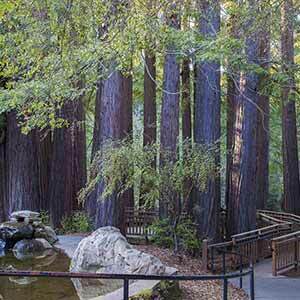 Tall, thin, perfectly straight redwood trunks rise through the foliage. 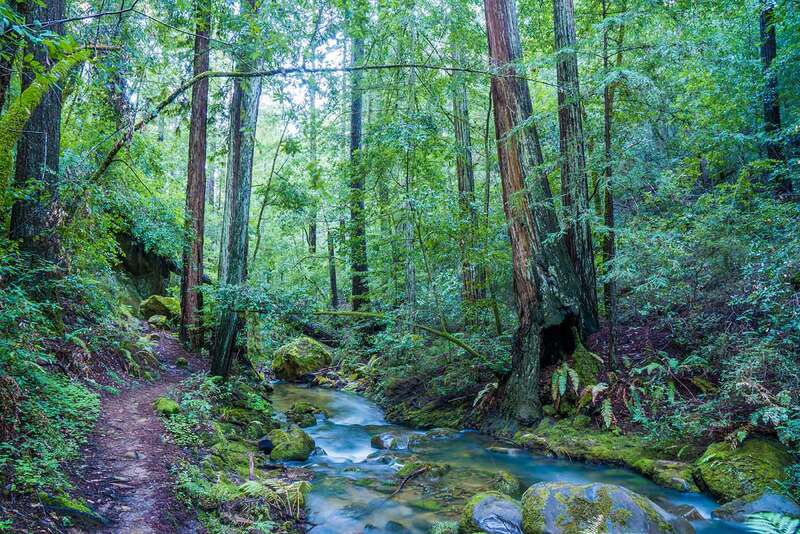 The trail descends into the Waddell Creek canyon, which with its long stretch of impressive old growth and lush vegetation is the most scenic redwood forest of the hike. The top of the trail is relatively open because of a prescribed burn a few years ago, but as the trail descends, the woods become increasingly dense and clogged with tanoak, and you’re enveloped in greenery. In places there’s an extensive, plush groundcover of redwood sorrel. There’s a brief view of Berry Creek Falls from the trail, but you’ll have to take a short side trip on the Berry Creek Trail to reach the best view of the big waterfall. 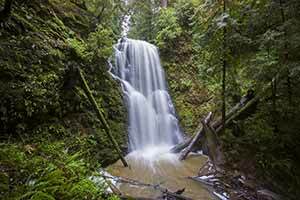 I highly recommend continuing the side trip past Berry Creek Falls to the redwood-filled glen above it, where there are two more waterfalls. This adds two miles to the trip but it’s the best part of the entire hike. Back on the Skyline-to-the-Sea Trail, the old growth ends just below Berry Creek Falls and the trail turns into an old logging road. 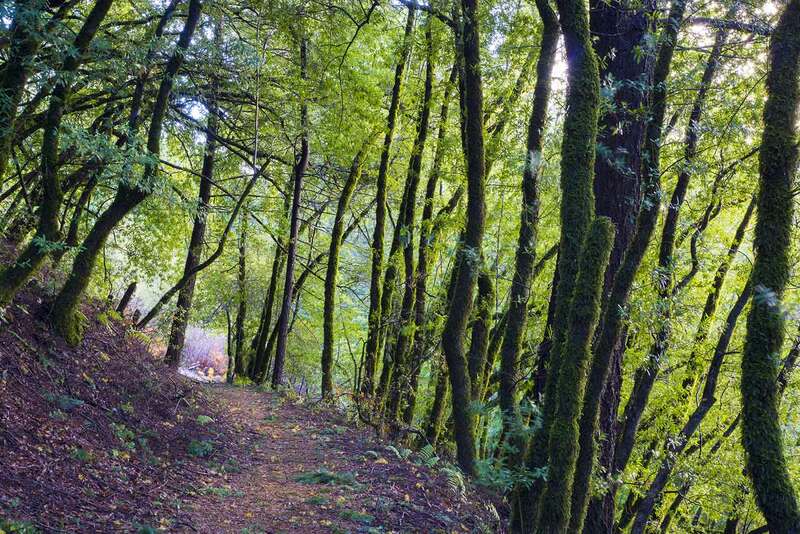 The road descends through mundane second-growth redwoods for a few miles, but just before the McCrary Ridge Trail intersection, the canyon widens and the woods open up, becoming bright and sunny with attractive patches of streamside maples. The wide, nearly level road makes for easy walking. Waddell Creek trickles next to the trail. Although there aren’t any old growth redwoods, this is still one of the most enjoyable parts of the trail. 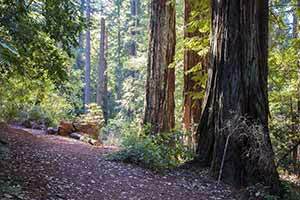 After Twin Redwoods Trail Camp, the trail splits. A sign directs hikers to the singletrack trail to the right and cyclists and equestrians to the dirt road to the left. Although it’s OK for hikers to take the shorter, flatter dirt road (the self-guided nature walk goes that way), the singletrack trail is much more scenic. The singletrack trail starts with a low footbridge over Waddell Creek that may be washed out after heavy winter rains. 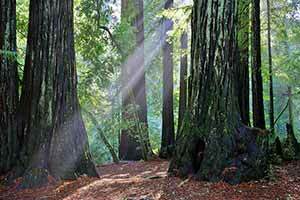 The trail then climbs through exceptionally attractive woodland with one or two final clusters of redwoods. The woods are much different than anything else along the trail, bright and lush, with lichens hanging from tree branches. 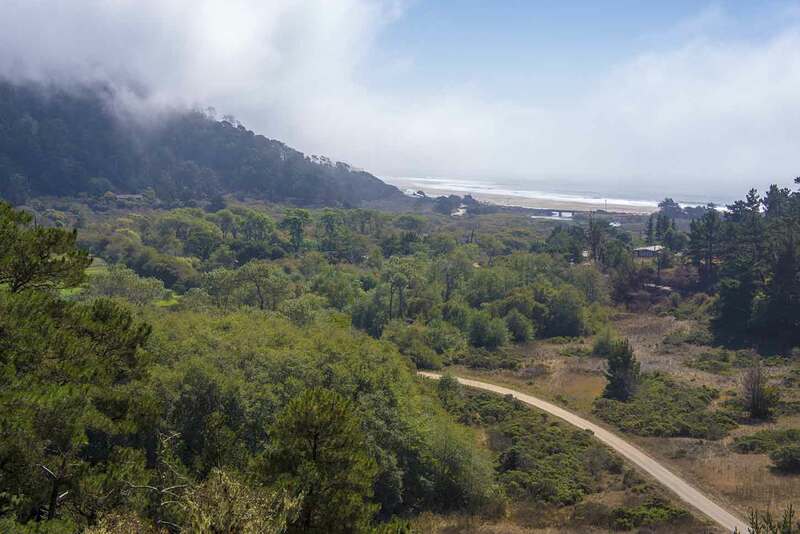 There are a few scenic views over the farms of the Waddell Valley, the ocean comes into view for the first time,and then the trail descends back to the dirt road. The alternate route, the road, passes Alder Camp and soon after passes through a small but attractive redwood grove that, though logged, has some pretty big trees. After that, there really isn’t much to see as the road passes by a few farms. This area is actually not part of the state park. The trail and dirt road join again near the ranger station, where there are a few exhibits. The final half-mile of road is paved and runs along the floor of the very pretty coastal canyon. The trail ends at popular Waddell Beach. The Saratoga Toll Road Trail completely bypasses the section of the Skyline-to-the-Sea Trail that runs alongside Route 9. However, it generally isn’t used because it doesn’t go by Waterman Trail Camp. In fact, I’ve never actually seen anyone else on this trail. It’s rougher and not as well marked as the Skyline-to-the-Sea Trail, and although it gets much less traffic noise, during gun club hours the sound of gunfire is more intrusive. 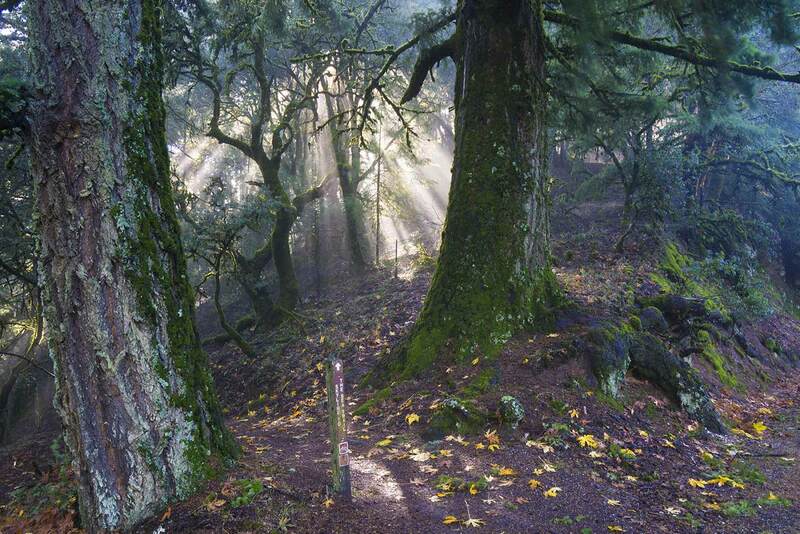 The trail descends at a constant slope through bay laurel and tanoak woods typical of the Santa Cruz Mountains. 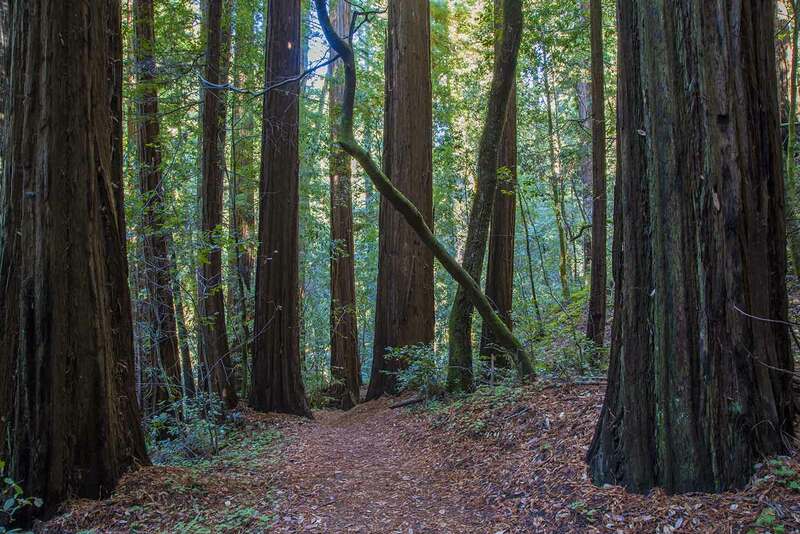 The woods are less scenic than along the Skyline-to-the-Sea trail, except for one point near Waterman Gap where the trail descends into a lush, dark canyon filled with second-growth redwoods. There are a few possibly confusing intersections; always take whichever trail continues the descent at the same slope as before. 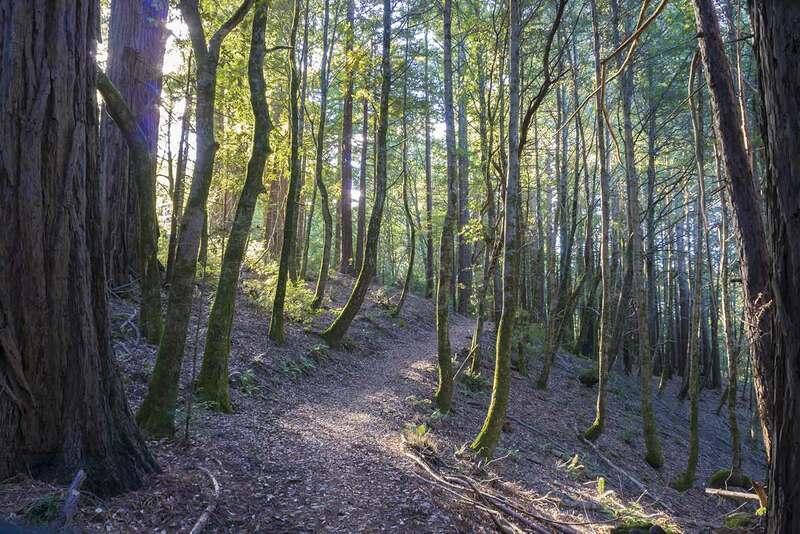 For a more challenging and remote route, start in Portola Redwoods State Park, climb the Butano Ridge Trail, and take the Basin Trail Easement to the Lane Trail Camp. 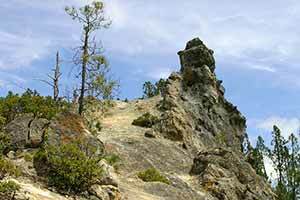 Then take the Basin Trail and join the Skyline-to-the-Sea Trail at China Grade. I actually like this route best of all, although it’s not really the Skyline-to-the-Sea Trail. Here are a few more photos of the Skyline-to-the-Sea Trail. The Big Basin and Castle Rock map from Redwood Hikes Press (I drew it) is the source of the full-sized maps that you see when you click the little map above. It’s much more detailed than the other maps of the area, which I think is a big help if you get lost. It covers the entire trail on one double-sided map and also includes the alternate routes described above. Available both as a waterproof printed map and as a download for iPhone/iPad/Android. Scale 1:25,000, size 26 x 39 inches, $10.95, 2017. 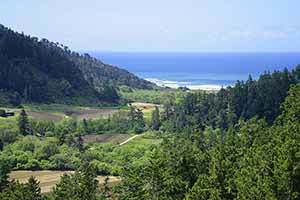 As an alternative, the Castle Rock entance kiosk and Big Basin visitor center have free maps of Castle Rock and Big Basin. These maps are less detailed but still usable for hiking. Scale 1:43,000 (Big Basin), 1:56,000 (Castle Rock), size 17 x 20.5 inches, free, 2015 (Castle Rock) / 2016 (Big Basin). All of these descriptions start from the main Castle Rock parking lot instead of Saratoga Gap. Tom Stienstra really likes this hike. Kevin Gong’s website has a thorough description of the hike with lots of pictures. Carl Wohlforth’s blog also had a good description that can still be read on the Wayback Machine. Kevin Trowbridge describes an attempt to hike the Skyline-to-the-Sea Trail using public transportation. The Pacific Coast Trail Runs Skyline to the Sea 50k and Marathon is held on a Saturday between mid-September and mid-October. About 200 runners run the route from Saratoga Gap to Waddell Beach. The Coastal Trail Runs Skyline to the Sea 50k and Marathon is held on a Sunday in June, with about 300 runners.